Apple's latest device went on sale on Wednesday, with hundreds of people queuing outside Apple's flagship store in central London for the launch. The issue relates to the mobile phone signal, with users reporting a drop in signal strength when the phone is held. 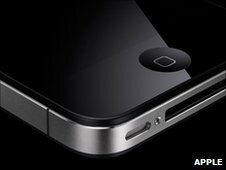 Richard Warner, who bought his iPhone 4 on Wednesday morning, contacted BBC News, saying that he thought the phone was "useless in its current state". However, it is not yet clear whether the problem affects all phones, or if the signal deteriorates when the phone is making a call or only when held in standby mode. Apple has yet to make a comment on the current controversy surrounding the latest version of its popular phone.